The last audition show! Thank the Voice gods. I am anxious for the next round. Whitney Myer – “No One” – I love her voice! She takes some wonderful liberties with her runs and inflections she makes on the song. I think she is one of the best auditioners thus far. She went TEAM ADAM. David Dunn – “The Man Who Can’t Be Moved” – He had some wavering in his voice and he wasn’t as strong as he could have been. He has a nice voice but sounded nervous and I think that is why the judges were hesitant. The Sheilds Brothers – “Dancing With Myself” – These guys are two balls of energy! And slightly chaotic. Maybe CeeLo will help channel that energy into success. They go TEAM CEELO. Cheesa – “If I Were A Boy” – She was a little weak in her lower register, but in the heart of the song she was strong, yet sort of uncontrolled. I understand their hesitation. But ultimately she went TEAM CEELO. Preston Shannon – “The Midnight Hour” – This guy is pretty awesome, and no one picked him! They are all crazy. No one turns around for this guy. Lex Land – “I Can’t Make You Love Me” – I am actually not a fan of her’s…she sounded really nervous. Maybe she would be better outside this situation. But she goes TEAM BLAKE. Cameron Novack – “You Oughta Know” – This guy was awesome, and CeeLo said he made a mistake. He is extremely versatile, too. But no one turns their chair around. Orlando Napier – “Waiting On The World To Change” – I loved this performance and I’m surprised Adam is the only one to turn around. This guy has some serious natural talent, and will probably be pretty awesome. He goes TEAM ADAM. Lee Koch – “Like A Rolling Stone” – The harmonica got Xtina in the end! He had an interesting tone, but no range, really. But maybe he has a few tricks up his sleeve. He goes TEAM XTINA. Wade – “Rehab” – This was a fun rendition of this often heard song. He will be perfect on TEAM CEELO. Adley Stump – “Last Name” – She was WAY pitchy. She was just all over the place. I can’t believe that both Blake and Xtina picked her. Desperate at the end, guys? She goes TEAM BLAKE. Beta, Aaron Gordon, and Lana Lowe, all get rejected by Xtina before she finds her match. Sera Hill – “I’m Going Down” – Aw, Xtina gets up and sings, and Sera holds her own with that diva! This one has some talent, and will be great on TEAM XTINA. The blind auditions are over! Yay! Next week we have the battle rounds, and this will prove to be very exciting. I am exciting for the format to change up a little. Plus Kelly C makes an appearance. Always good for some vocal reality show crossover. Until then! Another night of Voice Auditions! Ducky – “Tighten Up” – Ducky didn’t get picked…Although all the judges say they regret it. His performance didn’t come out and grab me either, and I guess I can see why he didn’t get picked. But his look was pretty rockin! Too bad this competition isn’t called The Look. Jonathis – “You Got It Bad” – This kid is a great dancer and a great performer, but I don’t know if he is really that strong of a singer. CeeLo and Xtina both turned their chair around, but ultimately he made a great decision and chose TEAM XTINA. Monique Benabou – “Mr. Know It All” – She has a STRONG voice but she had a few pitch issues especially around the bridge. But it wasn’t so bad that it can’t be fixed. I think that is why Xtina hesitated, but ultimately chose her. She went TEAM XTINA. Naia Kete – “The Lazy Song” – There are 3 generations of dreds in this family! She is a singer on the third street promenade, and she has a very nice tone to her voice. It sounded strong and soothing at the same time. Blake and CeeLo turned around and she chose TEAM BLAKE. Erick Macek – “Free Fallin‘” – I really liked his interpretation of the song, but his voice just wasn’t strong enough. He doesn’t get picked. Charlotte Sometimes – “Apologize” – She has this very indie sound to her voice, and made all four judges turn their chairs. But in a surprise decision, she chose TEAM BLAKE. Tony Vincent – “We Are The Champions” – This Broadway boy knocked it out with this performance. It is tough to pull off Queen and he did it well. He went TEAM CEELO. Anthony Evans – “What’s Going On” – He has a voice that can actually be quite versatile. He may not have big range, but as Xtina said, he was technically excellent. He went TEAM XTINA. Jamie Lono – “Folsom Prison Blues” – What a great rendition of that song! This is one of my favorite performances thus far. 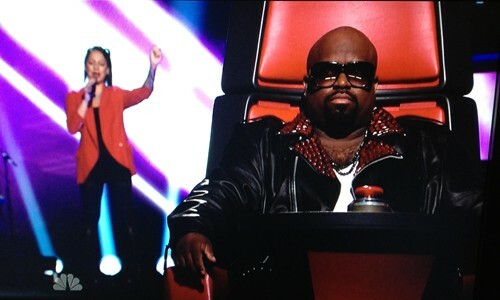 Adam and Ceelo turn around, but he goes TEAM CEELO. Dylan Chambers – “Valerie” – It wasn’t thrilling for me, and I understand why the judges didn’t pick him. he seems too young and needs more work. Justin Hopkins – “Babylon” – This was a less than thrilling song choice for him–he has a great voice, and I think CeeLo will do well with him. He goes TEAM CEELO. Nicolle Galyon – “You Save Me” – She has some serious raw talent that can just be refined. I’m hoping she can turn off the nerves and gain some confidence. She goes TEAM ADAM. A few snippets of performances: Ashley De La Rosa goes TEAM XTINA, Jordan Rager goes TEAM BLAKE, Karla Davis goes TEAM ADAM, and ALyX (WTF is with the spelling?) goes TEAM BLAKE. Eric Tipton – “You Make My Dreams Come True” – This guy would have gotten chosen if he picked a better song. Hall and Oates? Not so great. He doesn’t manage to turn a chair. Mathai – “Rumor Has It” – She is a cute girl and had a pretty nice interpretation of the song. Not surprisingly all the guys turned around, and not surprisingly, she goes TEAM ADAM. If I wanted to hear about people’s freak health issues, I would watch the Discovery Health channel. Please stick to singing. thx. 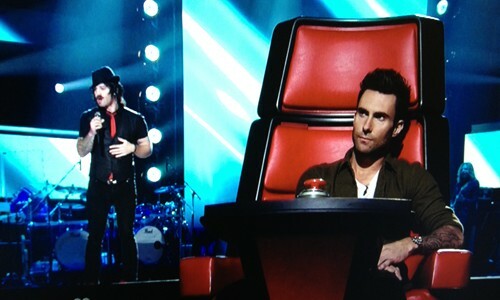 Another night of blind auditions on the voice! What will be in store tonight? Sarah Golden – You and I – Not really sure I liked how the show wanted to you try to be fooled if this androgynous figure was a guy or girl. She had a pretty good voice, and I think she would be better on a different song. She went with TEAM CEELO. Ellie Duhe – Mercy – She had some good chops but need some polish. I totally understand why no judges picked her, but I also understand why they all felt a little guilty for not doing so. Pip (with no last name) – House of the Rising Sun – He had a pretty great performance and caused all four judges to turn their chairs. They were taken in by the delivery and song choice and kept captivated by the orange Chuck Taylors. He chose TEAM ADAM. Erin Willett – I Want You Back – She had a great gritty female big rocker voice and gave a great performance. She only got one judge to turn around so she is TEAM BLAKE. David Grace – Sweet Home Alabama – He was ok but he did do some weird things with his voice that were a turn off. He needs to keep working at it. Katrina Parker – One of Us – Stylistically it was really interesting. I think Adam lucked out with this one because she is pretty good and unique. She went TEAM ADAM. Geoff McBride – Higher Ground – Wow, this guy has got some chops! He choses TEAM XTINA. Erin Martin – Hey There Delilah – OMG her voice is SO OBNOXIOUS. Adam is smart for not turning around for her. She chooses TEAM CEELO. James Massone – Better Find Your Loving – This kid is kind of a mess. I hope CeeLo can do something with him. He chooses TEAM CEELO. Winter Rae – Take A Bow – She was pretty pitchy, especially in her lower register. She is BFFs with Perez, who came out to support her. Unfortunately no judges turned their chair. Chris Cauley – Grenade – He has a very smooth silky voice. He asked Adam and CeeLo to arm wrestle for him. But he chooses TEAM ADAM. We didn’t get to see full performances, but Nathan Parret went TEAM ADAM, Brian Fuentes went TEAM BLAKE, and Moses Stone went TEAM XTINA. Jordis Unga – Maybe I’m Amazed – The final performance comes from Jordis, and they definitely saved the best for last tonight!. Wow, she is awesome, and she has a star name. This girl will go far. She picks TEAM BLAKE! There is some serious talent on this show! Wow. However, I will say again that these two-hour episodes are looooong. I wonder how many of these blind audition shows before they move on to the next round? The second episode of this show kicks off with a Judges Vocal! A Prince medley ensues (led by Xtina, of course). This is another thing that could NEVER HAPPEN on Idol. Pretty sure Randy can’t actually sing. The Line (Hailey and Leland) – “American Girl” – These guys were just OK for me. They have potential to be molded, and they harmonize well, but I didn’t think they are anything amazing at this point. All four judges turn around, and they go with the less obvious choice of TEAM XTINA. Jamar Rodgers – “Seven Nation Army” – Well hello familiar face Jamar Rodgers. Remember Danny Gokey’s BFF that got cut way before his time. Well, now he is getting his shot. He is now living in the Bronx. He reveals he is HIV positive…this never came up on Idol at all! I wonder if he never revealed it to producers, or producers were to scared to profile a kid with HIV. At any rate, I’m glad he gets to tell his story. His performance was pretty good, and I’m excited to hear more from him. CeeLo is the only judge who picks him, so he goes TEAM CEELO. Neal Middleton – “I Heard It Through The Grapevine” – He had a slightly manic southern rock performance. Decent voice, but he belongs with a band somewhere in Alabama. No judges picked him, so he heads home. Gwen Sebastian – “Stay” – She sounds very much like Sugarland, and I think she will do well. She chooses TEAM BLAKE. Pamela Rose – “Already Gone” – Another SoFlo contestant! She was really pitchy throughout the entire song, and caused none of the judges to turn around. Kim Yarbrough – “Tell Me Something Good” – Wow, she is another one of these people who I can’t believe has never been signed. She is amazing, and goes TEAM ADAM. Angie Johnson – “Heartbreaker” – This soldier was discovered by Carson Daily on YouTube, and he wanted her to have the chance to try out for this show. She has a nice gritty rocker voice, and she pulled off a tough song right on pitch. The only managed to woo CeeLo, so the is TEAM CEELO. Dez Duron – “I Want It That Way” – I think his song choice really what brought him down. He is not a bad vocalist, and it wasn’t the boy band song, necessarily, but more so chosing to sing a group song solo. I felt like he was struggling to sing both the lead and backing vocals. 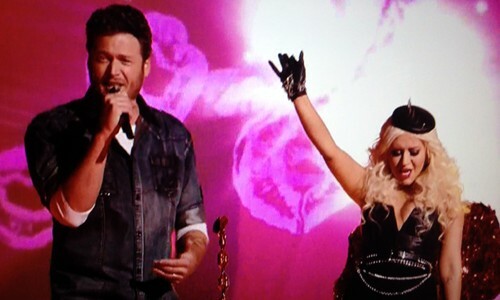 He didn’t manage to woo any of the judges, but Xtina seemed to regret not turning around. Lindsey Pavao – “Say Aah” – Such a hipster performer–I think she is a great song interpreter and has an interesting voice. She would get eaten alive on Idol, but she might do well in this format. She chooses TEAM XTINA. Hoja Lopez – “Teenage Dream” – She had some weird vocal issues – not pitchy, but like she was holding back, and her voice didn’t shine through. She was sent home. Jermaine Paul – “Complicated” – He has a great, great voice, but his performance was a little manic. I think he needs to work on control a bit. He gives the judges a hard time and it sounds like he might have some ego issues. He surprisingly chooses TEAM BLAKE. Angel Taylor – “Someone Like You” – I think Adam was right, that she was nervous at the beginning. You can tell she has mad vocals and she is holding back for some reason–I think she needs to let go and let those mad vocals shine. She chooses TEAM ADAM. Aw, I love that this episode takes a trip back to Checotah to relive Carrie’s audition journey. Idol says it was eight years ago, but I’m pretty sure their math is wrong–it was a lucky seven years ago Ms. Underwood came to audition. I heart that girl! Will we find the next Carrie tonight? Johnny Keyser – Whatup South Florida! And he goes to UCF. Wowzah, he IS going to be a big star. He sang Change Is Gonna Come, and it was a great rendition. I can’t wait to see more from him. Rachelle Lamb – What’s up with the scorned divorcing women this season? She sang some Faith Hill song, and she is ok, but her daughters accompanying line dancing was more amusing than the singing. We’ll see how she does in Hollywood. Reis Kloekner – OK, that is one Lutheran School last name – haha. Unfortunately the attempt at a sob story is making me continue to doubt the abilities of Nigel. Please, we can see right through that. I mean, just let the kid sing. Anyway, he sang Lean On Me, but he will get eaten alive in Hollywood Week. Ethan Jones – “Daddy’s In Rehab” sang some Edwin McCain, and in the words of Simon, I’m not jumping out my chair. Meh, another Hollywood casualty forthcoming. Lauren Gray – She sang some Adele and rocked it out. Wowzah. Another hot one! She is going to go far in this competition. As another audition season comes to a close (and not a moment to soon) we move onward and upward to Hollywood Week. Finally. So we embark on another night of auditions. Can we just get to Hollywood Week already? Brittanny Zika – She sang The Story by Brandy Carslile – She had a foretelling dream that she sang on stage with Sara Barellies, and then it (supposedly) happened. She is quirky and slightly awkward, and that is actually ok. Her voice was sort of interesting, but these soft, smooth voices sometimes get eaten up in Hollywood week. Brittany Kellogg – You’re No Good by Carly Simon – She is recently divorced and a mom of twin boys. Love her for singing Carly Simon! Her voice is great and soulful…I’m rooting for her to do well. Romeo Diahn – He is a refugee from Liberia and sang a soul-ish reggae-ish number. I love his spirit, but like Jennifer said, I fear that he will get eaten alive trying to sing other genres. Naomi Gilles – She sang some Steven Tyler Cryin’. And she is good! The classic idol big voice will do well in Hollywood. Jessica Phillips – Again by Faith Evans – It seems as though we are ending with sob stories this season! Her boyfriend had a stroke, and she has been acting as caretaker. Her voice was just ok, but she has a huge amount of soul and spirit. But how she fits into that Idol mold remains to be seen. My favorite tonight was Brittany, mom of twins. I am always partial toward the older contestants because I feel life experience along with talent really makes a well-rounded contestant, so I always root for a good late-twenties contestant! Well, that’s it for Portland! 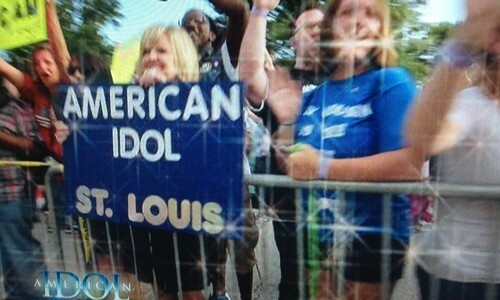 Tomorrow we (finally) finish the auditions in St. Louis. On an idolreview.net note, there are BIG changes coming. I have been working hard on version 3.0 of this site, which should go live sometime within the next week. Just a few more tweaks left! New features and content just in time for Hollywood Week. Baylie Brown – She was grouped with Antonella Barber back in season 6! I sort of remember her, but she has gotten way better. She has some potential to do well. Kristine Osorio – She is a newly single mom and at age 28, she is the oldest that can enter. I am rooting for the older contestants because as cute as all of the young and chipper 15 year olds are, the older kids come in with a bit of life experience–always a good thing in my book! Cortez Shaw – This guy sang Adele, and was a bit manic, as Simon would say. He had some chops in there somewhere, but I imagine Hollywood week will eat him alive. Ramiro Garcia – The obligatory sob story, this guy was born without ears. He sang Amazing Grace, and was just ok.